Below please find the Official Call, proposed bylaw changes, and job descriptions for County Party Offices. ELECTED POSITIONS WITHIN THE ORGANIZATION, TERM OF OFFICE 2019 - 2021. The five county officers are members of the County Central and Executive Committees. Is the Chief Executive Officer of the Party, presides over the County Central and Executive Committee meetings, and the county assembly/convention, and may appoint personnel to manage the affairs of the party. Serves on the State Central and Executive Committees as well as congressional and multi-county legislative district central committees. Oversees campaigns in the county in consultation with the county executive committee. Assists the Chair and acts as Chair in the absence of the Chair. Is a member of the State Central and Executive Committees as well as congressional and multi-county legislative district central committees. Coordinates one of the primary party functions. Assists the Chair and presides over meetings in the absence of the Chair and 1st Vice Chair. Coordinates one of the primary party functions. Records and keeps the minutes of all meetings and keeps the official list of the members of committees. Serves as member of multi-county district central committees or designates replacement. Oversees filing and updating results of reorganization process with state party and Secretary of State. Acts as liaison for one of the party functions. Has custody of the funds of the party and renders written accounts of receipts and disbursements and prepares and files all financial reports required by law, usually electronically. Serves as a member of the Weld Democratic Finance Committee. Represent Weld County in activities and meetings of the State Central Committee, the governing body of the Colorado Democratic Party, which usually meets two-three times per year. SCC makes policy and rules decisions. Serve as members of the Weld Executive Committee, which meets monthly, and assist with coordination of activities between the state organization and the county organization. Represent Weld County in activities and meetings of the State Executive Committee, which acts as an advisory committee to the state chair and officers. SEC makes some operational policy decisions and usually meets one-three times per year. Serve as members of the Weld Executive Committee. 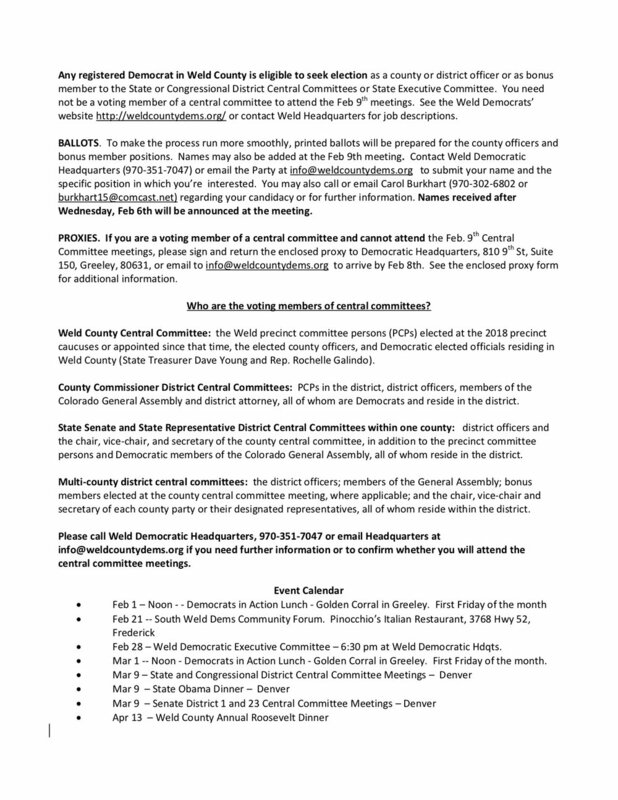 Represent Weld County in activities and meetings of the 4th Congressional District Central Committee, which coordinates the nominating process and supports the campaigns for U.S. Representative, State Board of Education, and CU Regent. Serve as members of the Weld Executive Committee and assist with coordination of activities between the CD 4 and county organizations. County Commissioner District Officers for Districts 1, 2, and 3 - Chair, Vice Chair and Secretary. Officiate at district assemblies in election years and district central committee meetings. Support district candidates' campaigns. District chairs, or their designees, serve on Candidate Development Committee. Legislative District Officers for Senate District 13 and House Districts 48, 50 and 63 - Chair, Vice Chair and Secretary. Officiate at district assemblies in election years and district central committee meetings. Support district candidates' campaigns. District chairs, or their designees, serve on Candidate Development Committee. State Platform Committee Members from House Districts 48, 50 and 63 - One per district to be elected. Active for approximately two months prior to state assembly, the committee considers resolutions to be reported to the state assembly. 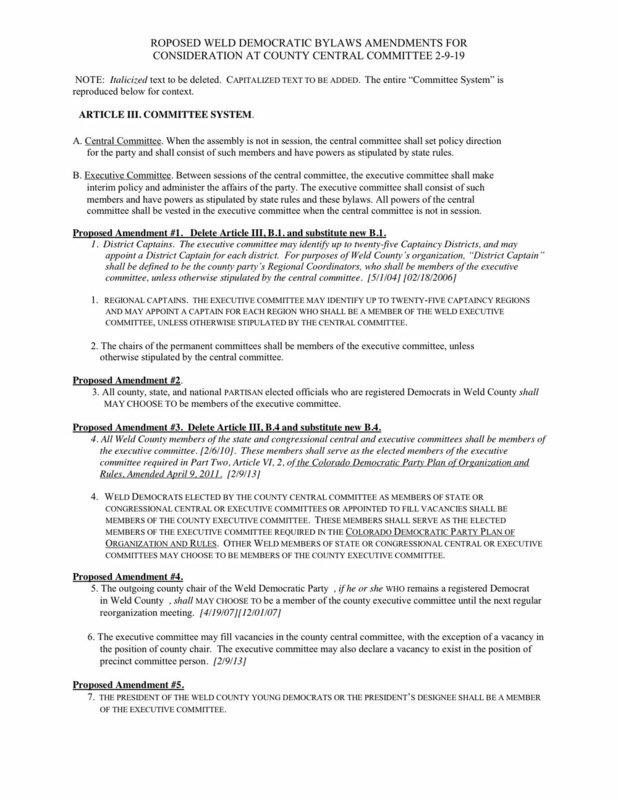 Committee on Candidate Development - a committee that coordinates candidate recruitment, development and campaign management activities for the party. Members include chairs (or their representatives) of legislative and county commissioner districts and other members appointed by the county chair. 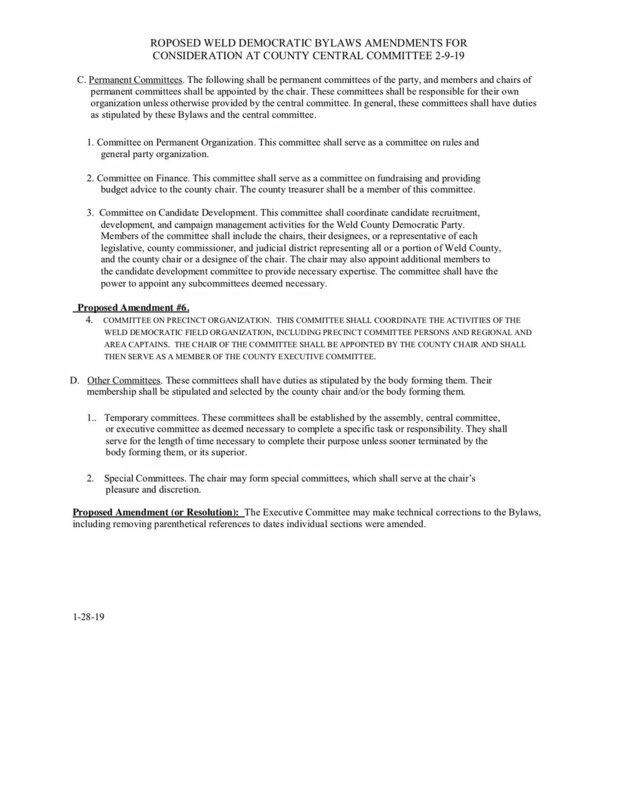 Committee on Permanent Organization - a committee on rules and general party organization, with significant responsibility for caucus and convention/assembly organization and procedures. Committee on Finance - a committee that coordinates fundraising and provides budget advice to the county chair. The county treasurer is a member of this committee. Events Committee, Volunteer Committee, Outreach, Communications, Get-Out-The-Vote (GOTV), Voter Registration, and special events or initiatives. Additional Committees and Functions include: Events Committee, Volunteer Committee, Outreach, Communications, Get-Out-The-Vote (GOTV), Voter Registration, and special events or initiatives. Coordinates directly with the Chair. Implements and leads the GOTV campaign and other party activities within all or an assigned part of Weld County and assists Precinct Committee People in their region. Participates in training conducted by the Weld County Democratic Party and oversees the organization of the Precinct Caucus activity within the region. Serves as a member of the County Executive Committee.